W. Scott Olsen and Bret Lott invited a dozen friends to consider one particular calendar month in the place they call home. The result is A Year in Place, a captivating collection of new writing by twelve eminent American writers. More than a montage of voices and experiences, A Year in Place illustrates, as Olsen and Lott explain in their introduction, the trends in American thinking about who we are and what we care about. Rick Bass takes us to the Yaak Valley of Montana in June, where fawns are arriving, "newly-emerged, knocked-legged and groggy, legs still unfolding from that long sleeping passage." Peggy Shumaker explores the special social and cultural time that is March in Fairbanks, Alaska, where a long winter has whetted the psychic despair of inhabitants who find in the "sky’s unbearable brightness . . . a waking pain beyond endurance." Michael Martone transports us through memory to Indiana in the 1950s where each May a blimp "yawed and floated up," wallowing above a suburban neighborhood on its way to the Indianapolis 500. 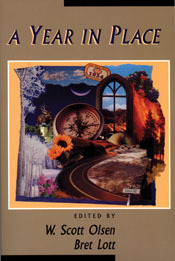 These and nine other contributions yield an unforgettable book about "the places we find ourselves blessed enough to be."